The commercial real estate in India still operates in archaic fashion with space being offered by developers and conventional business centres, with long-term commitment and upfront deposits. This results in SME’s and startups being unable to find standard office at accessible locations. The shared economy ecosystem is driving the consumption of various services including cabs & hotels by leveraging underutilized assets with just-in-time users. Awfis Space Solutions came with an idea to revolutionize the commercial real estate by providing ready to use, plug and play offices which can be booked through mobile/web app. Awfis Space Solutions is founded by Mr. Amit Ramani who brings with himself international experience in real estate, workplace strategy, architecture and interior design. Amit’s 18 years of global experience and his Master’s in Real Estate and Workplace Strategy from Cornell University has given him the foundation to create the Awfis concept and execute it at a rapid pace. Amit Ramani has over fifteen years of experience in areas of master planning, strategic planning, design management, workplace and business process improvement, six-sigma based strategies and facility planning. His strong background has allowed him to provide innovative and complex project services to multinational corporations such as Astra Zeneca, Duke Energy, Bank of America, AT&T, Marsh McLennan, Bristol Myer-Squibb, Lockheed Martin, Morgan Stanley, Goldman Sachs and Toyota. Prior to joining NELSON, he has worked with organizations such as HOK Consulting, Toyota Motor Sales and The Environments Group. 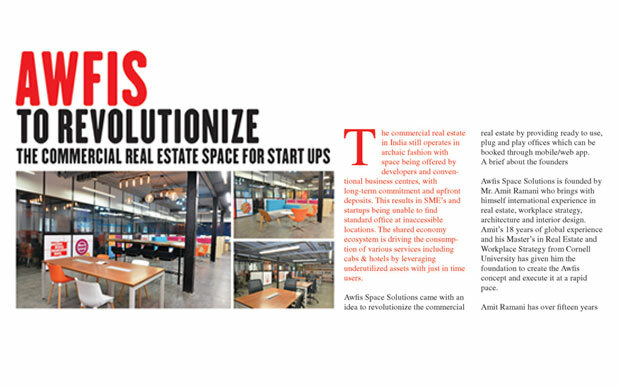 “Awfis Space Solutions Pvt. Ltd provides ready to use, plug & play, pro-working office spaces, embedded with the latest technology solutions for flexible and ‘Just in Time’ space utilization” says Amit. They are focused on redefining the way work gets by providing an ecosystem of inspirational work spaces and desks for the entrepreneurial community. Awfis has created proprietary Grade-A, highly energetic and inspirational community work spaces which includes 1,500+ desks, across 7 centers, operational across Mumbai, Delhi, Bangalore and is working towards ramping this up to 3,500+ desks across 15 “Work Innovation Centres” in these cities by March 2015. “Each center provides the latest technology enabled physical infrastructure which includes – video projection, NFC cards, CCTV, high-speed internet and laser printing. Members get benefits of using custom-sized multi-location workspaces on a flexible lease tenor ranging from an hour to up to 1 year (or more) depending on their work requirements” explains Amit. Additionally, Awfis has formed various strategic partnerships that provide its community members seamless access to leading service providers in the fields of accounting, legal, recruitment, payments, web services, mail management, healthcare and insurance making it a one-stop-shop for all requirements of an emerging corporate’s set up. Awfis has developed a revolutionary tailor-made mobile application that enables users to find, review, book work spaces in its owned / managed centers, as well as in a large repository of listed third-party meeting rooms in hotels across Indian cities on real time basis in a matter of seconds. ‘The comprehensive Awfis solution (work-desk, Wi-Fi, printing, meeting rooms, permanent address) provides everything that an office user will require, at extremely competitive costs making- Awfis as the new office” he continues. Lastly, members of the Awfis platform will significantly benefit from being part of the “Awfis Community” providing opportunities to network, ideate, and collaborate with like-minded entrepreneurial talent across varied business segments. Awfis caters to the S.M.I.L.E Community comprising of Small Medium Individual Local Entrepreneurs offering extremely affordable pricing starting from Rs. 4,500 /flexi seat/month to Rs. 13,000 / private cabin seat / month. Bookings can be made on a flexible lease tenor ranging from an hour to up to 1 year (or more). The current funding commitments of Awfis stand at ~USD 10+ million providing it requisite growth capital for its near term expansion plans. The target group of Awfis is largely active on digital medium, hence we are using various digital marketing tools to reach them. Awfis is organizing regular events, workshops and seminars such as speaker series and mentoring sessions for the Start-ups. It works towards facilitating access to industry thought leaders, VC’s, PE’s and creating networking opportunities for start-ups to interact and share ideas with each other. “We understand the challenges that are faced by start-ups and has formed strategic-alliances with leading service providers in the space of web hosting, accounting, legal services and a bunch of other key services that allows them to avail cost effective professional services on a pay per use outsourced basis” says Amit. The idea of ‘Pro-working’ has been welcomed by almost everybody who has come across Awfis. With growing start-up eco-systems, the concept of ‘co-working’ is becoming more popular day by day. This has helped Awfis to create high demand in the market. Awfis owns 1500 Seats and has 7 Centers, operational across Mumbai, Delhi, Bangalore. All these spaces are located at Central Business Hubs. Easily accessible from all the parts of the city by a varying number of transport facilities, these locations were strategically identified and converted into Awfis centers. Awfis has already set up 1500 seats across 7 centres and is setting up 3,000 seats by March 2016 across 15 centres in Mumbai, Delhi and Bengaluru. “We are targeting seats and 500 meeting rooms by Dec 2016 and aiming at becoming the largest player in this space” concludes Amit.